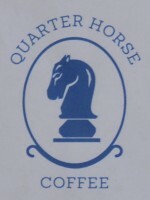 Quarter Horse Coffee, which opened in February 2015, may be new to Birmingham, but it’s not new to coffee or to the Coffee Spot. The original, which was in Oxford, remained open for a while before becoming Peleton Espresso, Quarter Horse focusing on its combined coffee shop/roastery on Birmingham’s Bristol Road, a few minutes’ walk south of the centre. The roastery is the subject of its own Meet The Roaster feature, which also covers the move to Birmingham, but for now, I’ll just concentrate on the coffee shop. Bright and spacious, Quarter Horse is a far cry from the much-smaller Cowley Road branch, although just as the original’s a product of limited space, so the new one’s a product of excess space. The décor is simple and extremely effective, being predominantly white, which, along with high ceilings, an uncluttered layout and windows front and back, make it feel even brighter and more spacious than it is. The coffee (with the exception of the decaf, from Bath’s Round Hill) is roasted on-site, with house-blend and single-origin on espresso, another single-origin on Aeropress and bulk-brew for those who can’t wait. There’s tea from Cardiff’s Waterloo Tea and a decent selection of food and cake, including breakfast served all day. Quarter Horse’s elegant façade feels quite old, Victorian perhaps, but the interior seems very modern. Occupying a knocked-through double-unit, the roastery, with its ultra-modern Giesen roaster, is on the left, the coffee shop, on the right. The divide is marked by a pair of pillars with a long, communal table between them. The only other indicator that you’ve crossed from one to the other is the floor, wooden on the roastery side, concrete for the coffee shop. Being a double unit, Quarter Horse has two of everything: two doors, two front windows, two benches on the pavement (although the busy dual-carriageway outside makes them rather unappealing). Technically, the left-hand door’s for the roastery, while the right-hand one leads into the coffee shop, but it really doesn’t matter which you use. That said, the one on the right leads you directly to the counter, where you’re confronted by the considerable selection of cake and sandwiches, the menu looming helpfully above you on the wall to your right. There’s an abundance of seating options. If you don’t fancy the tables dividing coffee shop from roastery (with their dilemma of whether to sit back-to-the-roaster or back-to-the-counter), there’s a choice of multiple tables with benches or bars with bar stools, all on the coffee-shop side. The first bench, complete with its own set of tables, is along the front window. Alternatively, against the right-hand wall, there’s a bar between door and counter. The counter itself, a beautifully-tiled affair with a lovely wooden top, has a classic L-shape, cake to the fore, the long part of the L running parallel to the right-hand wall. You order here, then, if you can’t stay, collect your coffee at the far end, past grinders and espresso machine. If you are staying, there’s a cluster of bar stools at the counter’s far end, where you can chat with the barista and probably get in the way of the takeaway customers. The coffee shop narrows beyond this point, the additional space being required for an enclosed kitchen. There’s more seating in the shape of benches and tables on the right-hand and back walls, while on the left, there’s a two-person bar. Right at the back, a glass door looks tantalisingly out onto a broad patio. For now, there’s no seating out there, but who knows what might happen? It would certainly make an excellent spot. I visited twice. The first time, en-route to the Ashes at Edgbaston, I had a flat white to go. On the recommendation of the barista, Alex, I went with the El Salvador Santa Ana single-origin (the guest). The following day, when I could stay a little longer, I had the espresso tasting flight, which was the house-blend, plus the guest, side-by-side for comparison purposes. Normally the house-blend is Quarter Horse’s seasonal Dark Horse Blend, but a sudden rush of cricket fans going to the Ashes had temporarily cleared them out, so it had been replaced by another single-origin, a Kenyan AA Nyeri. I thought I’d prefer Central American to African, but it was actually the other way around. Both were bright and fruity, and I enjoyed them both, but I found the Kenyan more balanced and well-rounded. The El Salvador was brighter, but not too sharp and, as I’d previously discovered in my flat white, it went very well with milk: sweet, but with its fruitiness coming through. I paired my espressos with a slice of apple, cinnamon and walnut loaf which was nothing short of divine. Rich, moist, spicy, crumbly and with real chunks of fruit, it was heaven in a slice of cake! December 2015: Quarter Horse was a runner-up for the 2015 Coffee Spot Best Cake Award. If you enjoyed this Coffee Spot, then take a look at the rest of Birmingham’s speciality coffee scene with the Coffee Spot Guide to Birmingham. This entry was posted in Birmingham, Breakfast, Cafe/Roaster, Cafes, Cake, Laptop Friendly, Retailers, Roastery, Sandwiches and tagged include by Brian Williams. Bookmark the permalink. Not one but 2Giesen.. Impressive. Soon to be only one… The little one’s off to Austria in a few weeks..
wonderful- btw thanks for tweeting re our Probat. A nice chap from Carfidd if on his way t osee us tomorrow about it . Ill keep you posted! Good luck! Hope you find a good home for Bertha. I have a fondness for the cosiness of the Oxford branch, but your photos of the Birmingham Quarter House are lovely — especially that gorgeous cobalt blue espresso machine.